UPMADE® Software gives brands and manufacturers a wholistic and transparent view of their material flow so they can make the most of what they already have. It makes it easy and fast for brands to create upcycled products. 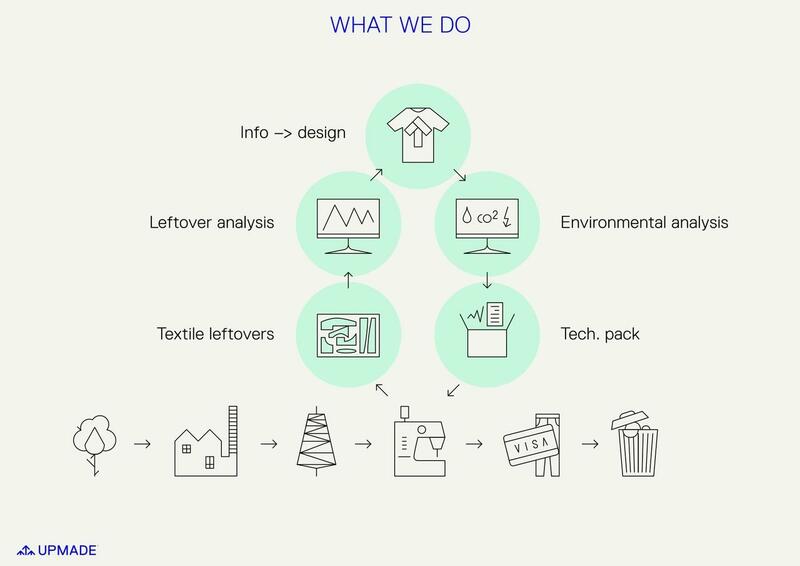 Here's how it works: Using production, fabric and design information from the brand’s original order, UPMADE® Software conducts waste analysis (to determine what kinds of leftover materials are available) and environmental analysis (to determine what resources can be saved as a result of upcycling). It is a unique kind of gap analysis. Using specific production data, a new upcycled product is created, leading to a physical sample. Each sample is presented with the results of a Life Cycle Assessment: how much energy and water it saves and how much CO2 emission and waste it avoids. An order can then be placed, and the upcycled product put into production. UPMADE® Software is available through individual licenses — click here to contact us about obtaining a license.